dir. Aleksandr Askoldov | 1967/1987 | 104 min. When a new regime comes, it says everything will be all right. Then it says it will be much worse. And then it says we have to find the guilty ones. And who’s guilty? Who? I’m asking you who is to blame? Synopsis: At the height of the Russian Civil War in Ukraine (1918 – 1922) Red Army cavalry commissar Klavdia Vavilova (Nonna Mordyukova) is unhappy to discover that she has become pregnant with the child of a fellow officer, who was killed in the line of duty. Upon returning from the front, she is given a three-month medical and maternity leave. Her superiors relocate her to a shtetl in the Ukrainian town of Berdychiv, where she is given a room requisitioned from the home a family of Yiddish Jews named the Magazaniks. There is initially tension between the despondent Commissar and the head of the Magazanik household, a boorish blacksmith named Haim. But the successful delivery of her child unveils to Vavilova an unexpected maternal instinct, and brings with it Haim’s hard-earned respect. As the White Army pushes the frontline closer and closer to Berdychiv, she becomes torn between her desire to stay with her child for the full term of her leave, and the impetus to rejoin her regiment for the good of the Revolution. Banned in the Soviet Union for twenty years after its completion in 1967, The Commissar is writer-director Aleksandr Askoldov’s only film. Produced to coincide with the 50th Anniversary of the October Revolution, it all but instantly made him a persona non grata for its un-romanticized depiction of the Red Army during the Russian Civil War and its particular focus upon ethnic Jews as a universal scapegoat of national and ethnic chauvinism, categorically rejecting the premise of Soviet Communism as a universally emancipatory project. For this film, Askoldov was tried and found guilty of “social parasitism,” and was expelled from the Communist Party. All copies of the film were seized by the K.G.B., with one particularly controversial sequence in particular being systematically excised and destroyed. If not for a single complete copy that was secreted out of Gorky Film Studio and hidden under Askoldov’s mattress for all those years, it is likely that we never would be able to appreciate the iconoclastic dissident’s complete vision. I first saw The Commissar in June of last year. I had fully intended to make a video essay on it, but for various reasons I did not. What follows as far as my own posts in this thread (in weekly installments) consists extensively of materials I wrote and collected for just that project, but which I now think may be better served here. 1)	Adaptation: While only a short story that was expanded by Askoldov to feature length, Vasily Grossman’s “In the Town of Berdichev” still provides an invaluable groundwork for understanding and interpreting The Commissar, especially as its author’s biography and own experiences with Soviet cultural repression comes to intersect with and parallel those of Askoldov. 2)	Biographical interpretation: Inextricable from the first, Askoldov’s experiences both paint a nuanced picture of a person living under incredibly strict (even deadly) socio-political circumstances; as well as clarify how and to what extent The Commissar became not only incompatible with those circumstances, but also exemplary as an act of subversion. 3)	Historical and political: Through the journey of The Commissar from short story, to screen, to state repression, to redemption, we are uniquely presented with a film that comes to internalize and embody the various meanings inscribed upon it by markedly different periods, and can thus assist us in comprehensively mapping and understanding history itself as an extra-diegetic narrative of the film. So, before we even begin un-packaging this wonderful, illuminating film, allow me to first recommend where and how you can see the film, and then to recommend a bibliography to supplement our viewing and reading. Of course, if anyone else has some texts to recommend, don’t forget to quote O.P. or DM me and I’ll add them to the bibliography. •	Vasily Grossman, “In the Town of Berdichev” (1934), is available in an English translation with annotations by Robert Chandler in his book of Grossman's collected writings The Road: Stories, Journalism, and Essays (2010), or in the Russian Life literary and photo-art journal Chtenia: Readings from Russia, Issue 14, Spring 2011. •	Marat Grinberg, Aleksandr Askoldov: The Commissar (2016), a small but densely packed historical, literary, and cinematic analysis of the film. I'll try to watch this in the next few days. Kind of interested in that this one doesn't sound like it'll handle the revolution as glossily as things like Doctor Zhivago or Reds did. I almost waited for the DVD from Netflix but decided to watch this on YouTube despite the 360p resolution. This isn't Falco's Der Kommissar. This isn't After The Fire's Der Kommissar. Kind of a bleak one what with the melding of the pains of childbirth and Jewish existential angst in the midst of skirmishes between the Red and White armies. Everyone's world-weary so it's only natural the film has a mostly gloomy and uncertain ending for its characters (excluding the very final tacked on scene). The standout moments take place in those delirious hallucinations of desert scenes in Vavilova's mind as she convalesces. And the disturbing flashforward to WWII. And the bullying kids clearly emulating their grown-up counterparts. Where you fall into ideology will determine if you're resonating more with the words of Klavdia Vavilova or with the words of Yefim Mahazannik. Though completed in 1967, the first public screening of Aleksandr Askoldov’s The Commissar (Комиссар) didn’t occur until some twenty years later. 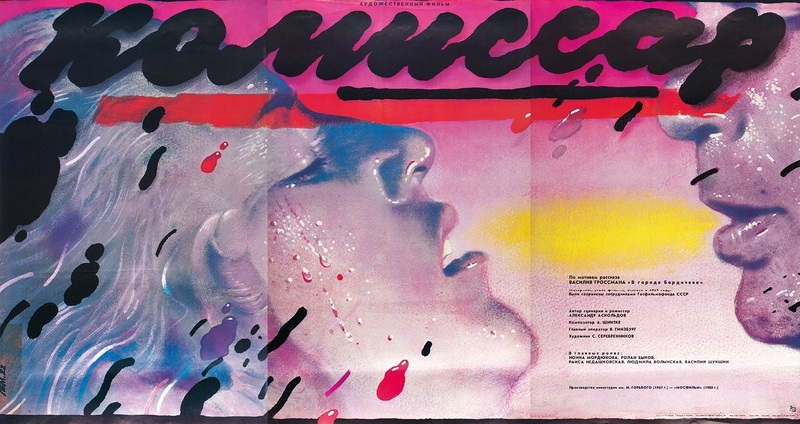 It was shown on July 11, 1987 at the White Hall of the House of Cinema in Moscow, before what Felicity Barringer for The New York Times described as “small audiences of foreigners and Soviet elite,” numbering about 500. Barringer further notes that the screening “wasn’t planned” or publicized in advance of the currently running Moscow Film Festival. This chilly acknowledgment in the waning years of the Soviet Union was the first step towards foreclosure of Askoldov’s struggle to see his vision shown to both a wider international audience as well as citizens of the U.S.S.R., for whom he had always intended its invective, historically revisionist message. But to tell the story of Askoldov’s struggle is to also tell the parallel story of Vasily Grossman. "COMMUNIST FIRST - JEW SECOND"
Grossman was a Russian Jew born in Berdychiv, a city that now resides in the northern regions of modern Ukraine, but which at Grossman’s birth in 1905 occupied the Imperial Russian Pale of Settlement. 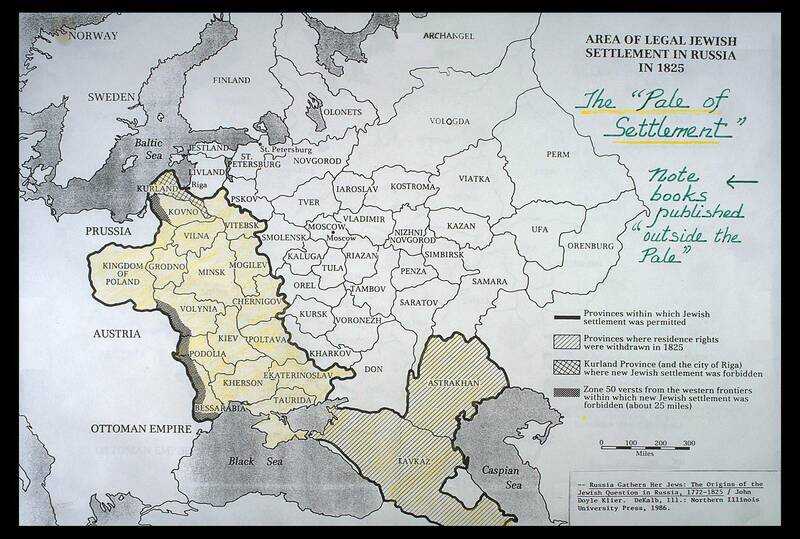 The Pale of Settlement itself had existed in a fluctuating state since the late 18th-century when it was established under Catherine II as an area to which Jewish residence in the empire was oppressively restricted. The period in which Grossman was born and grew into manhood was one in which, particularly in the wake of devastating pogroms in the 1880s, as well as even worse waves of politically-backed pogroms before, during and after the Revolution of 1905, many young and so called “emancipated” Jews had increasingly come to identify their own persecution with the broader socialist revolutionary firmament in the empire. Nonetheless, the relationship between ethnic Jews throughout the empire and the political majorities during the sweeping changes and violence of the 1917 Revolutions and the Civil War had always remained conditional at best. 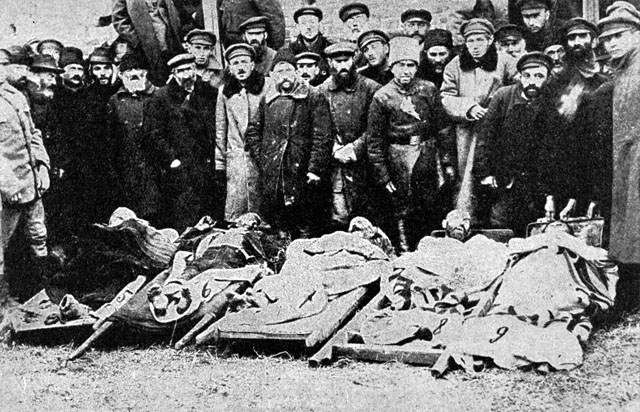 Particularly in the Ukraine, Jews during this period suffered a wave of even more devastating pogroms committed by both the reactionary Whites and factions of the Red Army. 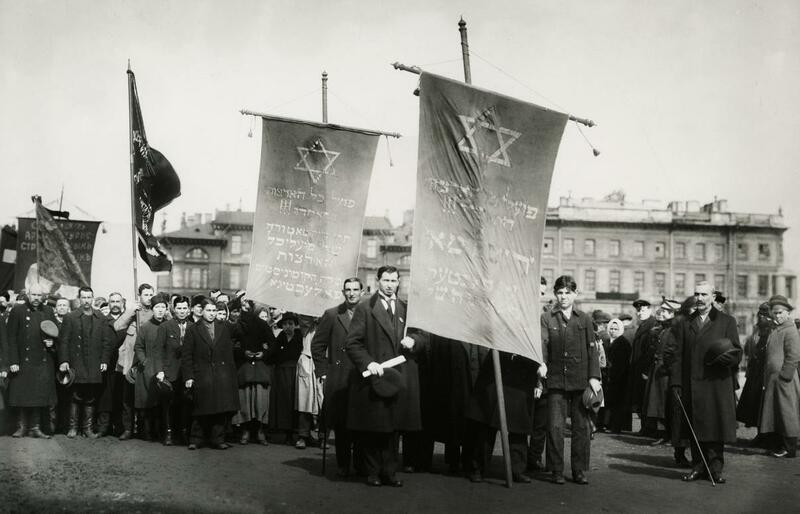 While the Soviets eventually adopted measures to purge pogromists from their ranks in 1919, these policies mostly confirmed that Jews only had less to fear from the Red Army than from the more overtly anti-Semitic Whites, who marched to the slogan “Strike at the Jews and save Russia.” Meanwhile, the general antagonism between the Red Army and the Ukrainian National Republic produced conditions in which numerous pogroms were carried out. Grossman was studying in Kiev at the Higher Institute of Soviet Education when the retreating Ukrainian Army took on a campaign of organized pogroms in multiple towns, including in Berdychiv. These acts went largely without official reprisal and, indeed, Berdychiv itself was virtually destroyed by the advancing Red Army just a year later. When the dust had settled and the Soviets had emerged victorious, the position of ethnic Jews remained ambiguous in a dominant culture that was still rampant at both popular and political levels with anti-Semitism. For Grossman, for any Jew with even a modicum of optimism for the success of Russia’s revolutionary experiment, these tense cultural conditions must have been profoundly stifling, the expression of Jewish ethnicity and identity implicitly tethered to a totalitarian assumption of the preeminence of the party line above all. Especially for the privileged and educated, the scientists and artists, one could certainly be a Jew... but one must always first be a Communist. This claustrophobic position is reflected in Grossman’s first published literary work, the short story “In the Town of Berdichev”; printed on the 2nd of April 1934 in the journal Literaturnaya gazeta when he was only 28 years old. 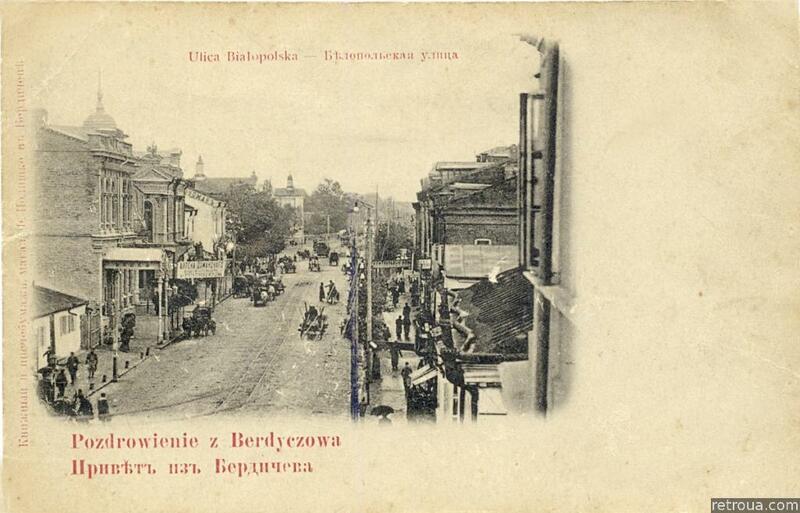 Acclaimed at the time of its publishing, even among writers and literary critics cynical to the repressive atmosphere of socialist realism, “Berdichev” takes place some time, during the Polish-Soviet War, which lasted from February 1919 to March 1921, contemporary to the wider Russian Civil War. Children... children – do you have any idea what misery they bring with them?... Children are such a grief, such a calamity, such never-ending trouble. Every day they want to eat, and not a week passes by but one of them gets a rash, and another gets a boil or comes down with a fever. And Doctor Baraban – may God grant him health – expects ten pounds of the best flour for every visit her makes... And every one of my lot is still living. Not one of them’s going to die. Childbirth... You think it’s child’s play, like war. Bang, bang – and there’s an end to it. No, I’m sorry, but that’s not how it is at all. More then necessarily about the interaction between a staunch Communist and this marginalized Jewish family, Grossman tells a complex tale about the iniquity of gender, where Vavilova’s male comrades are persistently sexist and condescending towards her despite her loyalty and accomplishments, and where the pain and burden of giving birth and raising a child are treated as negligible to the united political struggle. Indeed, one could even mount a postmodern, intersectional critique of “Berdichev,” describing Grossman’s prose as drawing a fundamental parallel between the conditions of Jewish ethnicity and the feminine gender, with Beila and the midwife Rosalia Samoylovna acting as symbolic mediators between Vavilova and Magazanik’s differently privileged but also differently oppressed conditions. They were marching towards the Poles. Looking at the faces of the singing cadets, she lived through once again what she had lived through two years before. The Magazaniks saw a woman in a sheepskin hat and a greatcoat running down the street after the cadets, slipping a cartridge clip into her large grey Mauser as she ran. Once there were people like that in the Bund. Real human beings, Beila. Call us human beings? No, we’re just manure. It’s a very charged conclusion to the story, as Beila tells her husband to go prepare milk for the baby and the cadets disappear into the uncertainty of the waging war. Particularly Magazanik’s calling not only himself but presumably also the entire humble Jewish community “manure,” would seem to suggest Grossman’s embrace of the Communist First, Jew Second platitude, encapsulated by Alyosha indefinitely taking her mother’s place in the communal requisitioning of the Magazanik’s home. However, to the modern reader, and presumably even to the discerning Soviet one, Grossman’s prose actually demonstrates a considerable subversive edge. In one way, for instance, by putting words into the mouth of Magazanik, a figure who is routinely admonished by his wife as a rude ignoramus, Grossman is also able to symbolically transgress Soviet denial of ethnic identity, embodying this swarthy and stereotypical figure in order to all the more critique the bigotry of the regime. The cheek of these snotty little bastards!... Whose clever idea was this? As if there weren’t a single bourgeois left in the whole town! As if there weren’t a single room left for the Soviet authorities except where Magazanik lives! As if there weren’t a spare room anywhere except one belonging to a worker with seven children! What about Litvak the grocer? What about Khodorov the cloth maker? What about Ashkenazy, our number one millionaire? Yes... It’s like in the old tale... So little work to do in the house that she had to go and buy herself a clutch of piglets. So few cares of my own that I have to have a whole partisan brigade giving birth in my house. To be honest with you... this is the best time of all for us townsfolk. 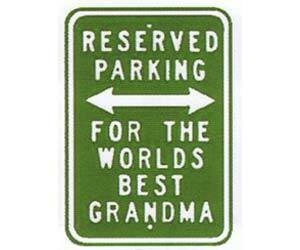 One lot has left – and the next has yet to arrive. No requisitions, no ‘voluntary contributions,’ no pogroms. The townsfolk were all in their cellars and basements. Their eyes closed, barely conscious, they were holding their breath or letting out low moans of fear. Everyone, even the little children, knew that this bombardment was what is known as an “artillery preparation” and that there would be another forty or fifty explosions before the soldiers entered the town. And then – as everyone knew – it would become unbelievably quiet until, all of a sudden, clattering along the broad street from the level crossing, a reconnaissance patrol galloped up. And, dying of fear and curiosity, everyone would be peeping out from behind their gates, peering through gaps in shutters and curtains. Drenched in sweat, they would begin to tiptoe out onto the street. The patrol would enter the main square. The horses would prance and snort; the riders would call out to one another in a marvelously simple human language, and their leader, delighted by the humility of this conquered town now lying flat on its back, would yell out in a drunken voice, fire a revolver shot into the maw of the silence and get his horse to rear. And then, pouring in from all sides, would come cavalry and infantry. From one house to another would rush tired dusty men in blue greatcoats – thrifty peasants, good-natured enough yet capable of murder and greedy for the town’s hens, boots and towels. Everybody knew all this, because the town had already changed hands fourteen times. It had been held by Petlyura, by Denikin, by the Bolsheviks, by Galicians and Poles, by Tyutyunik’s brigands and Marusya’s brigands and by the crazy Ninth Regiment that was a law to itself. And it was the same story each time. It’s here that we get the clearest indication that Grossman’s choice of the town where he was born is not merely born of nostalgia married to socialist realist fantasy. It is also a choice that allows him to more intimately acquaint his readers with the thankless positions of the Jews themselves. In that last paragraph, he almost imperceptibly sneaks the Bolsheviks into the early part of the list of the town’s conquerors, but by association draws an equivalency between these partisans, between the Bolsheviks and the Poles that they oppose. Here, as with Magazanik’s gallows joke, there is no distinction between the “requisitions” of the Soviets and the “pogroms” of their opponents. They are both treated as fundamentally oppressive, occupying forces exploiting the vulnerable ethnic minorities of Berdychiv. What’s more, this scene from the collective perspective of the town’s Jews immediately precedes the one in which Vavilova and, ironically, Magazanik too are taken up in the patriotic parade of the Soviet cadets. Though technically true to the letter of socialist realism, Grossman’s strategic juxtaposition of prose casts a subversive pall over the proceedings. Just as there is now a spiritual equivalency between the Soviets and the Poles in the eyes of the Jews, the symbolic order of Grossman’s prose draws a parallel equivalency between Vavilova’s abandonment of Alyosha and the Soviet’s figurative abandonment of the Jews to the fanatical wind of partisan jingoism. In his manuscript, Grossman adds one more sentence to his ending: Beila sighed and said loudly, “A Tatar, an ignorant Tatar!”... Beila has already, once before, called her husband a Tatar – and so her words carry weight. As well as criticizing Vavilova for having abandoned her baby, Beila is criticizing her husband for appearing to condone Vavilova’s behaviour. Evidently, either Grossman or his editors decided that this ending was too dangerous... Grossman poses an important question with shocking sharpness. 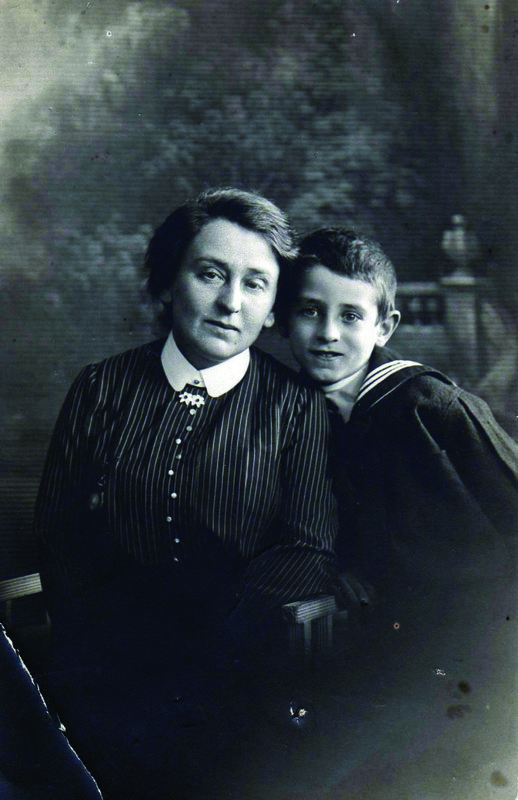 Soviet literature of the 1920s and 1930s contains many examples of people sacrificing a husband, wife or parent, but only Grossman asked whether it is right for a mother to abandon her new-born child for the good of the cause. 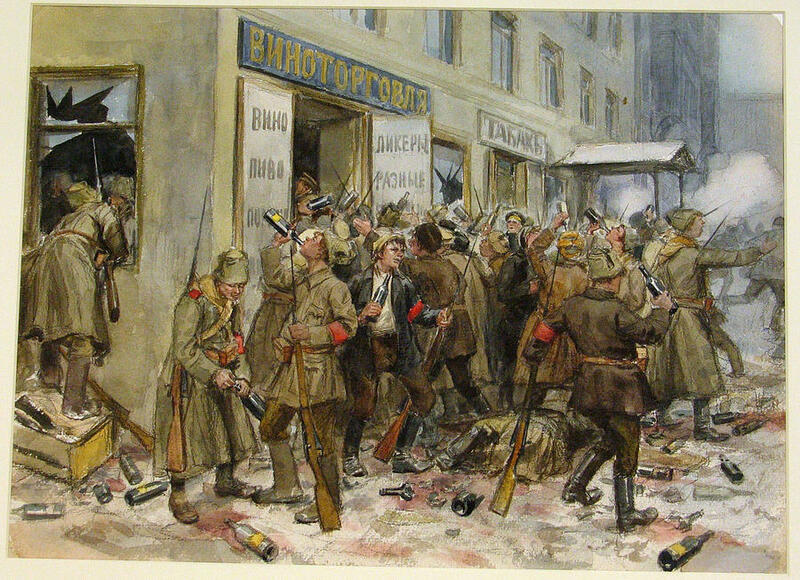 When Grossman returned to Moscow from his trip to the front, his car dented by shrapnel after he had barely escaped the German capture of Orel, his editor immediately demanded to know why he hadn’t described the “heroic defense of Orel.” Grossman answered that there had been no defense of Orel, heroic or otherwise. He was ordered back to the front. But as not only a Jew, but also specifically a native of the Ukraine, it was as Grossman advanced with the Red Army during the winter of 1943 that he was witness to the most violent impact on his spirit. Seeing the unprecedented cruelty of what the now retreating Germans had left behind, his writings turned away from sanctifying Red soldiers to mourning the dead. There are no Jews in the Ukraine. All is silence. Everything is still. A whole people has been brutally murdered. Now he learned what had happened after the Germans took the town, two and a half years earlier: in the course of two September days, Berdichev’s entire Jewish population – thirty thousand people – was murdered in a clearing outside the town. 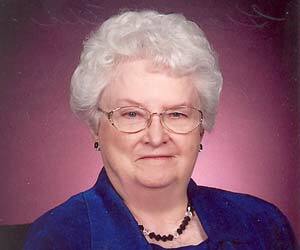 Grossman’s mother was among the victims. Even as the advance of the Red Army into Poland forced an even more irrevocable confrontation with the sheer scope of Nazi atrocities, that familiar byline that forced Grossman to self-censor “Berdichev” rang true: Communist First, Jew Second. Suppressing what they knew about the Holocaust, the Soviets also veiled it in terms convenient to the Union’s political establishment. For instance, when a public report on the atrocities at Majdanek was finally approved, the project was assigned not to Grossman, but to Konstantin Simonov, “who ignored the special status of the Jews in the Nazi organization of death.” When Grossman and a fellow Jewish author Ilya Ehrenburg attempted an independent documentation of the mass-murder of Soviet Jews by the Nazis in what became The Black Book of Soviet Jewry, publication was again suppressed. One of Grossman’s few opportunities for some semblance of journalistic liberty during this period was the publication of a twelve-thousand-world article on the Treblinka camps in the November, 1944 issue of Znamya, which was subsequently read at the Nuremberg trials. Nonetheless, Grossman’s experiences proved beyond a shadow of a doubt that the primary occupation of Stalin’s regime was the strategic allowance for the glorification of Soviet exceptionalism, and not historical recognition of the unique status of Jews in the rise of German fascism. 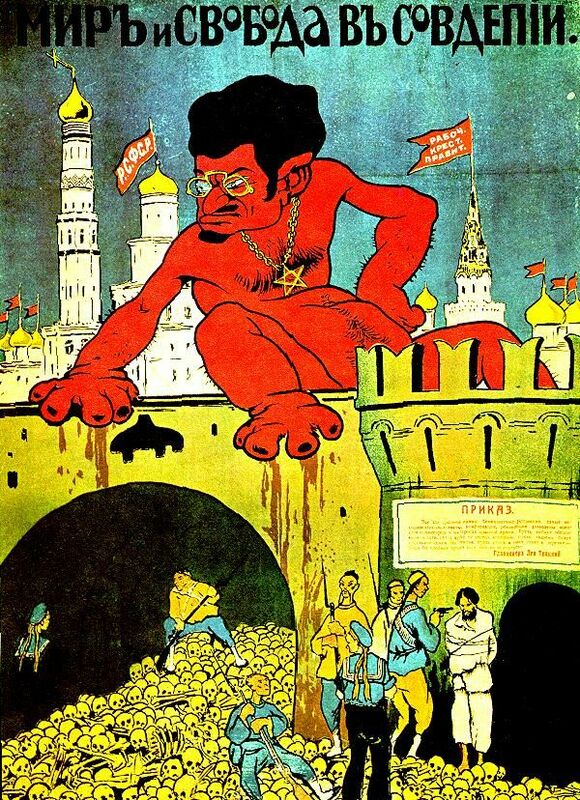 The black joke of the Jewish condition in the Soviet Union is that, again, just as with the wars against the reactionary Whites, Ukrainians, Poles, they could count upon their supposed liberators and comrades in revolution only to oppress and exterminate them less than the alternative. But both sides could contrive more than enough rhetorical ammunition to condemn the easy targets of historical bigotry. For the Whites and Nazis, they could conflate Jewishness with the degeneration of revolutionary Marxism. For the Soviet Union under Stalin, on the other hand, they could conflate Jewishness with the entrenched bourgeois, cosmopolitanism, and Zionism. So not long after the war, a crackdown came in response to the increased despondency of Jewish intellectuals and activists in Stalin’s paradise. Solomon Mikhoels, the artistic director of the Moscow State Jewish Theater and chairman of the Jewish Anti-Fascist Committee was assassinated on January, 1948. 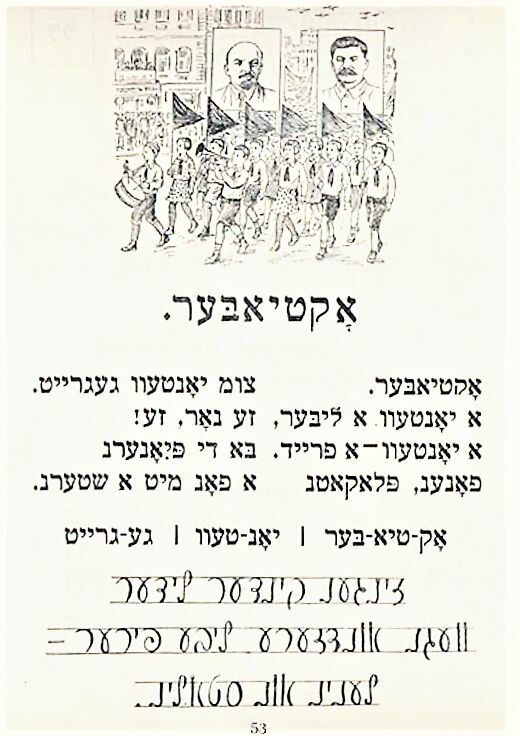 In the wake of this, the Jewish Anti-Fascist Committee was disbanded, and many of its members were arrested, charged with disloyalty, bourgeois nationalism, cosmopolitanism, and conspiring with U.S. and Zionist imperialists to establish a Jewish republic in Crimea; itself a trumped up charge rooted in a plan that the J.A.C. had proposed as a refuge for Soviet Jews against discrimination, and to which the Kremlin was at least initially open. The next five years saw an intense propaganda campaign against Jews, veiled again in the conspiratorial threat of “rootless cosmopolitanism”; culminating in accusations, firings, arrests, tortures, and political killings associated with the Doctors’ plot, a propaganda campaign that saw a group of mostly Jewish doctors libeled for a fabricated conspiracy, in which they were alleged to have undermined the health and planned the assassinations of top Soviet leaders, including but especially Stalin. While Grossman himself was never arrested, he was subject to a pressure and demoralization not unlike that which he must have studied in the many Sonderkommando he interviewed in compiling The Black Book: He and many other well-known Soviet Jews were compelled to sign a letter denouncing those implicated in the plot, and to beg Stalin’s mercy. While this letter was ultimately never published, still being formulated up until the time of Stalin’s death on March 5, 1953, this experience was the culmination of Grossman’s total alienation from the supposed ideals of the revolution. Grossman’s return to life as a fiction author was no less strangled by cruelty. His last published novel in his lifetime was 1952’s Stalingrad, later renamed For a Just Cause. A historical novel extrapolated from his experiences as a war reporter, the Soviet press initially lauded it. But with the chilling of rootless cosmopolitanism, the tide turned against Grossman’s vision, which was seen as minimizing the role of the Communist Party in ensuring victory in the Second World War. His next novel, Life and Fate, was completed in 1960. But when he submitted copies of its manuscript to editors for Znamya and Novy Mir, these, along with rough drafts, were seized by the KGB from the offices of both journals as well as from Grossman’s own home. Still never arrested, Grossman became a persona non grata in the Soviet literary world, the ruining of his reputation only exacerbated by the way it seemed that the Central Committee was almost content to let him fester away in his alienation and rage. Indeed, now virtually incapacitated by stomach cancer, any official procedures probably seemed moot, even as Grossman was reported to have continued to speak venomously about the Party in private, and, worse, to be preparing a second so-called “anti-Soviet” novel: Everything Flows. Both Life and Fate and Everything Flows reflect the obviously different character of a middle-aged man no longer so inclined to self-censorship. They portray characters whose initial idealism toward the revolution has been despoiled by the Party’s complete alienation and denial of the individual. But particularly relevant here is Everything Flows, the story of one Ivan Grigoryevich, a man who returns to the U.S.S.R. after imprisonment in the Nazi death camps, only to discover that there is no home left for him. The most despondent aspect of this novel is not just its recognition of the ultimate failure of the Soviet Union, but also in Grossman’s channeling of his unique experiences as a Soviet Jew. The so-called “emancipated Jews,” like Grossman and his father before him, had identified in the revolutionary dream their ascension from oppression into a truly equal unity of all people – despite their differences, united in the commonality of class struggle. But what ultimately had become of the revolution was the opposite of this. Poet and JAC member Peretz Markish opined in 1949, “Hitler wanted to destroy us physically, Stalin wants to do it spiritually.” Within the Soviet interpretation, universalism meant a purging of the particular, a surgical excision of the degenerative figment of ethnic identity. No longer even Communist First, Jew Second, the Jew, effectively, did not exist. Vasily Grossman died on September 14, 1964. He was 58-years-old. "THE CHILL AND THE THAW"
Askoldov was born Iakov Kalmanovich on June 17, 1932. Though born in Moscow, Iakov grew up in Kiev, where his father managed one of the Ukrainian city’s largest factories. But Iakov’s father was also, like Grossman’s father, a product of the spirit of the “emancipated” Jews, a native of the Belorussian shtetl of Lutsk who patriotically took up the banner of the Soviet Revolution and became a commissar during the Civil War. In the end, the extent to which Askoldov’s early experience would parallel not only Grossman’s but also specifically the poetic symbolism of “In the Town of Berdichev” becomes unsettling. In 1937, at the height of internal Soviet repression, not only Iakov’s father, but also his mother were arrested. Not unlike the babe of Grossman’s story, the frightened, vulnerable Iakov took refuge in the house of Jewish family friends before eventually being adopted by his grandmother and returned to Moscow. As with Grossman, Iakov’s story is about the death of the emancipated Jew, a figure reduced to neurotic self-censorship by a political establishment that refuses to acknowledge the pathological severity of the culture’s entrenched anti-Semitism. The boy who had lost his father to the Soviet maw came into the climate of the post-Stalinist Thaw under the pseudonym “Aleksandr Askoldov,” effectively denying his patrilineal, Ukrainian-Jewish heritage. As a whole, Thaw intellectuals conceived of the Soviet past in two ways: they searched for ‘socialism with a human face’ as the antithesis of Stalinism, and at the same time romanticized the epoch of the Civil War, with its ‘commissars in dusty helmets’... [T]hey strove to harmoniously fuse the idea of the individual with the idea of the Soviet collective. The implicit contradictions of this socio-political milieu are reflected in the throws of Askoldov’s pre-cinematic career, vacillating wildly between reform-minded academic liberalism and reactionary participation within the state’s repressive cultural apparatus. 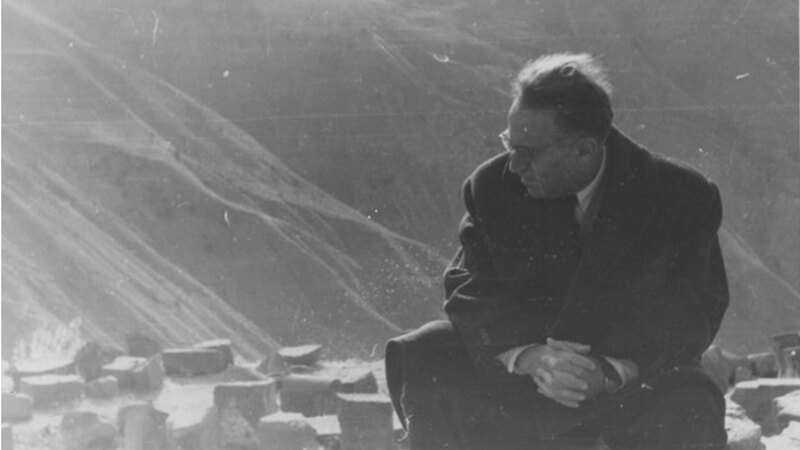 During the ‘50s, Askoldov studied philology at Moscow State University, seemingly destined for the life of a literary critic with a particular focus on reviving patriotic interest in Russian authors whose reputations had been tarnished during the Stalinist era. Askoldov had planned to write his dissertation on the works of Mikhail Bulgakov, and even worked with the author’s widow to petition for the publication of his repressed novel The Master and Margarita, which was ultimately published in 1966. In 1954, he joined a consortium of writers and critics who signed a letter in defense of the literary critic Vladimir Pomerantsev. Though more generally an invocation of the more liberalized cultural atmosphere of the Thaw, the signing of this letter was also an implicit defense of Pomerantsev’s call for a relaxation of socialist realism’s rigid formulas in favor of more ‘sincere’ portrayals of both Soviet history as well as contemporary reality. It was very clear to me that I was a failure. I didn’t defend my thesis, or rather, I abandoned writing it because I lost interest in the topic and didn’t want to force myself to work. I had a degree in philology from the university, but the literary profession did not appeal to me and I was not good at it... I had no plans for the future [...] and did not even try to become anybody. Having fallen out of love with literary criticism, and having no sense of direction, Askoldov went on to work for the Soviet Ministry of Culture, first as a theater censor, and then as a chief film censor. The irony of one of the most controversial filmmakers in Soviet history working on the behalf of the establishment is palpable. But these lateral movements in Askoldov’s career – from part of the liberal, literary intelligentsia; to Party functionary; to filmmaker – encapsulates what Grinberg frames as the dualistic mentality of Soviet liberals, while providing in this specific case a crucial understanding of fatalistic motivations. If the icy grasp of Soviet repression was thawing, what had not thawed was the trauma and neuroses produced by spending decades under such repression. The reform-minded push for “socialism with a human face” ultimately betrays an emphatic desire to relive the idealistic nostalgia of a revolutionary people who had emerged from tyranny, without which there is only this directionless alienation, Ivan Grigoryevich still lost and unwanted. Reflecting on this, it would seem that The Commissar does not represent merely another repressed film – It represents the breaking point for a liberal and patriot, the repressed Iakov Kalmanovich determined to speak for all the silent voices, particularly those who were still, despite the pretenses of the Thaw, categorically denied. It’s impossible for me to say whether Askoldov was aware that, between 1934 and 1939, Grossman himself had worked on a screen treatment for “In the Town of Berdichev.” Still, Askoldov’s literary career did ultimately intersect with Grossman. Likely having read the story in a 1958 collection of Grossman’s short works, Askoldov also developed a personal relationship with Grossman’s widow, through whom, after the author’s death in 1964, he learned about the repression of Life and Fate. Despite the Thaw, Grossman was still a highly controversial figure among high party officials, which led Elena Stishova to conclude in 1989 that merely the approval by the Maxim Gorky Central Film Studio’s committee to produce The Commissar must have been the product of “ideological negligence,” citing particularly some members’ objections to the script’s de-romanticized depiction of the Civil War and Commissar Vavilova’s violence. 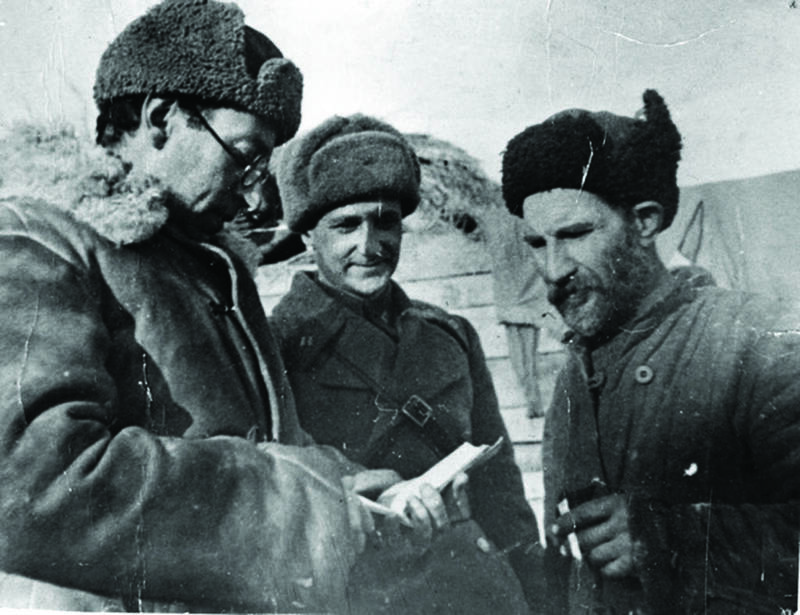 Grinberg suggests that Askoldov’s script – faithful to the already self-censored letter of Grossman’s work of socialist realism – was nonetheless significantly different from what Askoldov ultimately filmed, and lacked what he calls the “apocalypticism” of this finally realized vision. While advised by the committee and its sympathetic chief Aleksei Romanov to make changes, Askoldov not only didn’t adhere to them, but produced a product where what changes had been made were sure to provoke the socio-political order even further. On the other hand, not taking Askoldov’s memory for granted, Grinberg also suggests that these changes may be repetitive of the former literary critic and film censor’s directionless behavior throughout the Thaw, reflecting an authentic evolution of Askoldov’s political consciousness through the experience of trying to bring “sincerity” and “a human face” back to socialism in the arts. At a certain point, his liberal-patriotic motivations either changed or recognized their own self-defeating fatalism: The Commissar would not merely act as a conduit for ‘reforming’ the Soviet mentality – It would function as an uncompromising rejection of the establishment’s entire historical and political-ethnic theory. So what happened? How did a highly anticipated film, slated as a prestigious and patriotic work perfect for the politically essential reform-climate of the Revolution’s 50th anniversary, and also praised as a progressive move in terms of representation for ethnic and religious minorities in Soviet popular arts, become artem non grata? 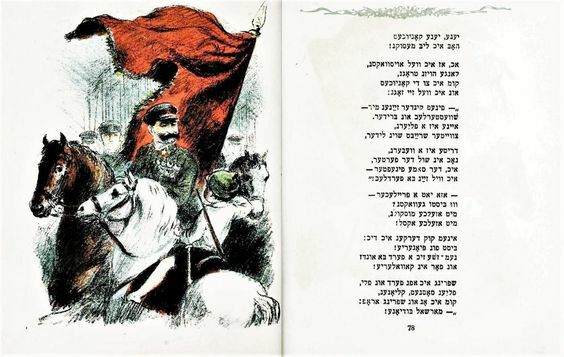 The Commissar, despite its previously extoled progressivism in depicting Jews, upon completion in August of 1967, was born into a climate of both official anti-Semitism as well as unofficial Jewish anti-fatalism. Most notable among [the film’s critics] is the film-maker Leonid Trauberg, Askol’dov’s mentor and a victim of Stalin’s post-war anti-Semitic campaigns. In January 1967, Trauberg commented on The Commissar during a meeting at the studio: ‘Overall I love the film.’ ... In august 1967, two months after the Six-Day War, he proclaimed at the discussion of the finished film, ‘I want to see a film about a commissar, I don’t need a film about the sad fate of the Jewish people. Trauberg attempted to revive the film from state repression in January 1968, but only on the condition that Askoldov make several changes, “including lessening the ‘caricatural’ side of the Jewish protagonist’s character.” In private, State Committee of Cinematography chief Aleksei Romanov went even further, suggesting that Jewishness should be erased from the narrative completely: the Magazaniks would be changed to Tatars, and the film’s most controversial sequence – depicting Vavilova envisioning her Jewish hosts as victims of the Holocaust – would be removed. The Commissar was completely banned in July 1968. Askoldov was tried for “social parasitism” and expelled from the Communist Party. Prints of the film were seized and locked away, and all copies of the offending Holocaust sequence were destroyed... with the exception of one, smuggled out of Gorky Studios, and sheltered under Askoldov’s bed for twenty years. 3)	the beginning of perestroika in the late 1980s, a period in which many previously banned works were being reappraised and released. A number of documents from the summer and autumn of 1986 indicate that the authorities had no problem with lifting the ban on The Commissar, and in fact called for it to be screened not only in the USSR, but also abroad. They instructed the State Film Committee to allow Askol’dov to make the changes to the film that he deemed necessary, to rework the sound in some of the scenes, and to reinstate him, with financial compensation, to the position of a film director. Yet a number of prominent film-makers who opposed the film in 1965-67, such as Sergei Bondarchuk and Stanislav Rostotskii, as well as the head of the State Film Committee, Filipp Ermash, strongly objected to this decision. Accusations of ‘dehumanizing’ and ‘de-heroizing’ the Revolutionary legacy again came to the fore, as well as the fresh supposition that the film’s emphasis on the ‘Jewish question [...] could lead to an unfortunate spark in inter-ethnic strife.’ As a result, the committee decided to essentially re-ban The Commissar, the only film to suffer such a fate during perestroika. The path to seeing The Commissar finally recognized would turn out to be forged through the only means that the U.S.S.R.’s stagnant, bureaucratic institutions could understand: public embarrassment. 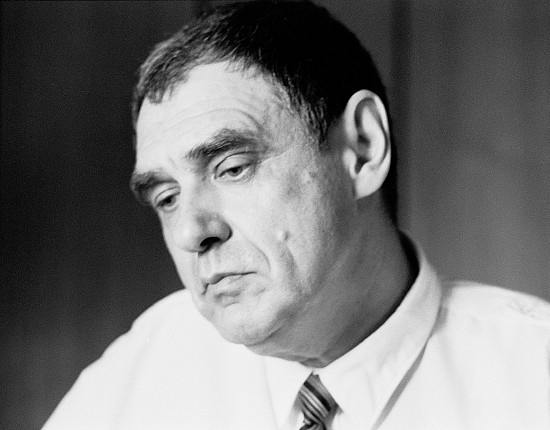 At a July 9th press conference at the 15th Moscow International Film Festival in 1987, Askoldov rose from his seat in the audience and challenged Film-maker’s Union director Elem Klimov to allow him forum to speak. Twenty years ago I made a film about the cancerous tumour in human history – ethnic chauvinism – the main enemy of our Revolution and our society. There are, however, anonymous forces in our society that prevent this film from being shown, even at a venue like this. I think that this is completely wrong and undermines the essence of glasnost [...] and of the grand programme which our Party has put forth. I ask the presiding committee to allow the film to be shown on this screen. It is amazing to read after all these years Askoldov’s words still ringing with such a tenor of patriotism, unable to discern if these represent his sincere political idealism despite all his hardships; or if they are simply a neurotic and strategic projection, formally necessary in order to achieve some increment of socio-political progress. Whatever the case, it was this act that precipitated Gorbachev’s decision to hold that initial, unplanned, unannounced screening of The Commissar on July 11th. On July 20th, the Central Committee of the Party approved its limited release. Wow, great choice. I saw this in college and could never shake it. It's a hard rec to pull off (and oh lord, have I tried) but you're really laying it out well. It's got everything that's great about Soviet film: complex characters, room for both traditional drama and balls-to-the-wall experimentation, and an insane behind-the-scenes censorship story. The Russian Civil War is such a perfect setting for the story and it's unfortunate that because it's steeped in so much specific history/culture, it makes it largely impenetrable to a Western audience. What's not impenetrable though is just the sheer apocalypticism of it. It's fascinating that this was a film made in the '60s, because you could easily see it as being a direct product of just the 'end of history' moment of the Soviet Union slowly collapsing in on itself, where it now just casts this whole pall over the past. I touch on it a little, but Marat Grinberg gets into the apocalypticism of the film much more deeply in that book I linked to in the bibliography, which is a must. He also does a better job of fleshing Askoldov's cinematic influences, whereas I've mostly focused on Grossman's story. Maxim Gorky, namesake to the studio that produced Askoldov’s only film, defined socialist realism as “the ability to see the present in terms of the future.” Propagandistic at its core, Gorky’s definition not only succinctly emphasizes the grounding of socialist realism in an ongoing, grand narrative of the Revolution, but also implies the essential quality of the past; providing, as in the climax of Grossman’s short story, an overpowering nostalgia that gives Vavilova the motivation to drive headlong into the uncertain future. Sprung from a socio-political milieu in which Soviet popular writers were interested in reforming socialist realism with a more sincere, nominally less romantic approach to history, The Commissar as a linear narrative is frequently challenged by an aesthetic subversion of Gorky’s definition. Here, past, present, and future are in constant antagonism with one another and in the mind of the Soviet patriot. This is established in the very first sequence of the film, which also illustrates one of the controversial sticking points for its censors, i.e. the un-romantic, demystifying portrayal of Commissar Vavilova’s violence. Within the rigid parameters of state-enforced socialist realism, political violence almost always takes a form that necessarily lionizes the patriotic soldier and his mission on the behalf of the Revolution. Askoldov’s film, on the other hand, presents a brutally honest scenario in which Vavilova’s patriotism is viewed dispassionately. We are not introduced to the Commissar as a stalwart fighting the menace of the reactionary Whites. Instead, we are introduced through her condemnation of a Red Army deserter to death. But more striking is how Askoldov chooses to stage and edit this scenario. Rather than showing the deserter’s condemnation and then his execution, present and future are intercut in a post-Eisensteinian montage. We are shown the preparation for and carrying out of the execution, but rather than seeing the deserter die, we are shown him fainting at the thought of what is about to happen. Literally framing the present in terms of the future, Askoldov also alienates the spectator from Vavilova’s perspective, instead emphasizing the abject perspective and condition of this non-patriot. The interest of the visual narrative becomes not the rudimentary carrying out of martial law, but about this marginalized figure thrown into disarray, the aesthetic of montage overtly conflated with the coercion of Soviet hegemony. 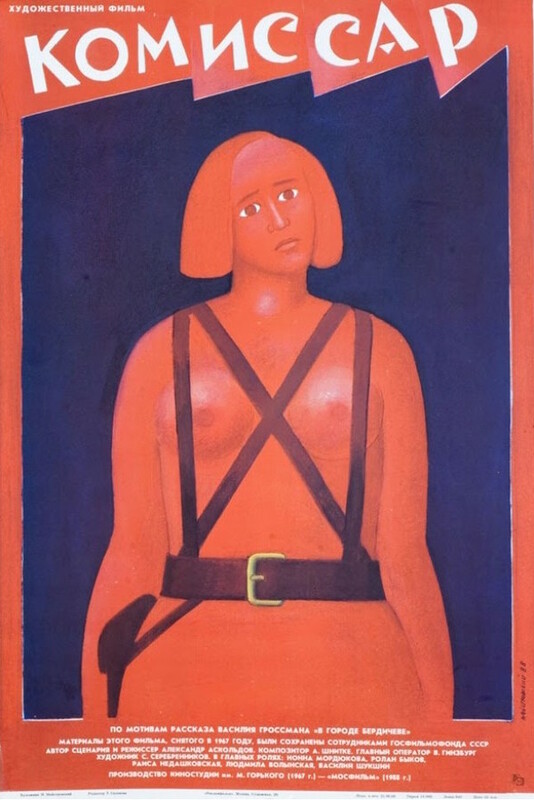 The other way in which this striking sequence relates back to socialist realism is the extent to which Askoldov both adheres strategically to some form of self-censorship – not explicitly showing the execution and not allowing any outside commentary on its ethics – while also challenging what had been the predominate self-censorship strategy of Soviet popular artists for decades. 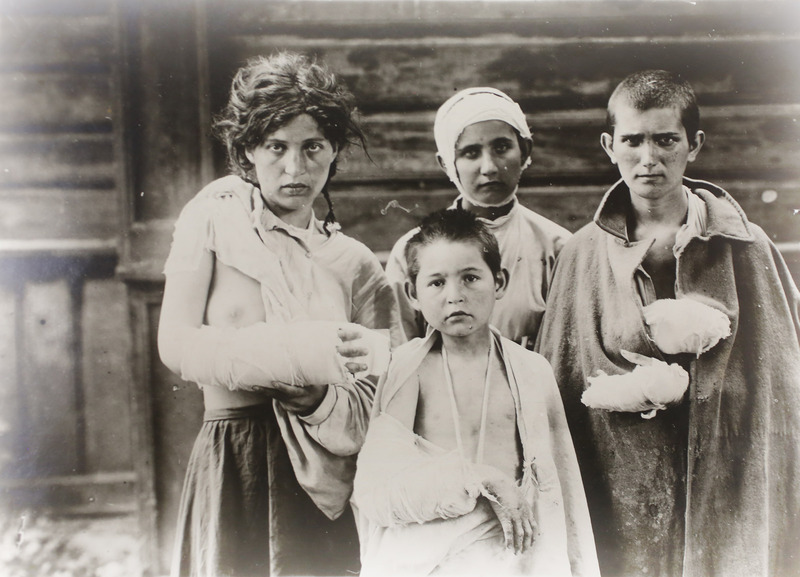 To describe this, Grinberg evokes Oleg Aronson’s idea of “positive absences” – the manner in which Soviet writers and other popular artists could express their discontent with Soviet hegemony not through explicit representations of hypocrisy or injustice, but through the conspicuous absence of certain details that draws the reader into the multiplicity of implied meanings even within a heavily censored work of functional propaganda. We have already seen this technique demonstrated to a certain extent by Grossman’s story, in which Magazanik’s uncouth characterization and the collective perspective of the Berdichev Jews allows the author a veil through which to criticize the fundamentally oppressive nature of Soviet rule without implicating himself as the earnest mouthpiece of these views. 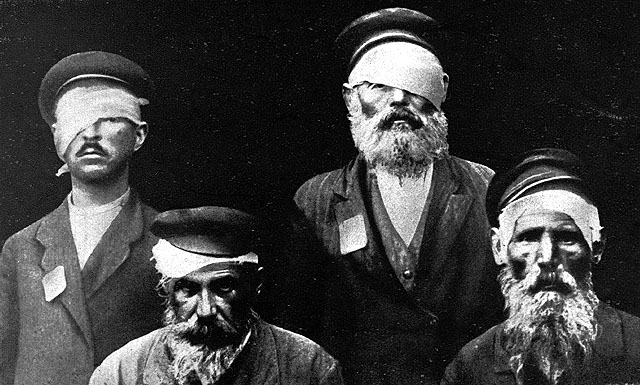 In a similar vein, one could argue that Askoldov’s style of montage here calls attention to the conspicuous absence of seeing the deserter actually being executed, suggesting more profoundly than the cruelty of the execution itself the intrinsic injustice of the symbolic order in which this is possible; where the deserter is already, symbolically and literally, a dead man walking. This opening, with the fainting and execution montage of the deserter in particular, also serves as foreshadowing of Askoldov’s further embellishments upon Grossman’s highly self-censored work of socialist realism. While faithfully adapting Grossman’s juxtaposition of the demands of motherhood and war, Askoldov uses a similar technique of temporal juxtaposition – this time between the lived present and the remembered past – in order to frame Vavilova’s development as a character in a way that’s much more fraught and uncertain then in Grossman’s story. In “Berdichev,” the pull upon Vavilova to forsake her son to the care of the Magazaniks and rejoin the front is presented in a way that suggests only her patriotic drive to the exclusion of all other concerns. The Commissar, on the other hand, suggests a more fundamental antagonism that is created within Vavilova once her child is born. In one scene in particular, Vavilova is shown fleeing from the traumatic memories of war – represented by a quartet of Red Army cadets who may or may not be real - desperately clinging to her child in a way that suggests both its particular vulnerability to the violence of war, as well as its fetishistic embodiment of a new life for Vavilova. In Askoldov’s film, Vavilova’s motherhood and living with the Magazaniks awakens in her a sense of identity independent of Soviet hegemony. Conversely, the manifestation of this repressed desire and new fear reveals her former unconditional patriotism to be a symptom of fatalism, a fanatical drive towards death as the only liberation. For Grossman’s character, the only question of motivation regards if and when Vavilova leaves her child to rejoin the Revolution. 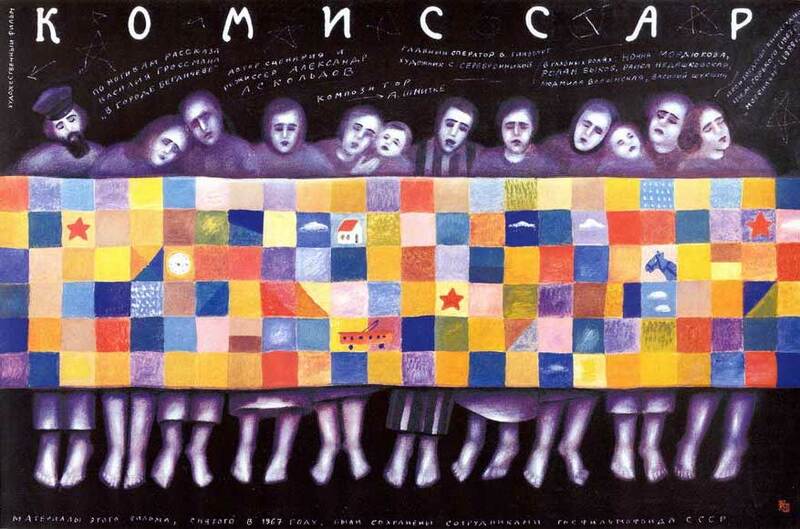 For Askoldov’s commissar, the conflict is more deeply entwined with the psychological and existential uncertainty of one living within a Soviet hegemony, pulled violently between two impulses that seem impossible to synthesize within a symbolic order where all expression must be strategically self-censored, and where the spiritual fulfillment of the individual or minority is subservient to the inscrutable and unaccountable collective. As in Grossman’s story, Vavilova’s temporary decommission is juxtaposed with the perpetually marginalized status of the Magazaniks. And complementing Vavilova’s traumatic experience of motherhood, Askoldov employs the Magazanik children in order to confront the spectator with the oppressive dehumanization of Jewishness that the Revolution not only hasn’t resolved, but also has, rather, facilitated through its fanatical emphasis on ideological conformity over unique ethnic and/or religious identity. Perhaps even more striking than the oft’ cited Holocaust sequence is one in which the Magazanik children are shown torturing one of their siblings, acting out a pogrom in the same way that one would play soldiers. More than using Magazanik’s boorishness in order to strategically censor a critique of Soviet anti-Semitism, Askoldov rejects positive absences in order to portray and all-consuming nature of anti-Semitism in Russian-Ukrainian culture. Much like the montages intercutting between past and present, the Magazanik children come to embody both the youthful past as well as the inevitable future of the Revolution’s inhumanity. They do not interpret the pogroms as a particular horror that only the reactionary Whites would inflict. They understand it intuitively as a completely normal and consistent expression of power, and as an expression that they are enticed to emulate. These mere children have already learned to think of themselves as Communists First, Jews Second, to the extent that they even unconsciously erase their own ethnic identities and enact the purge of Jewishness. 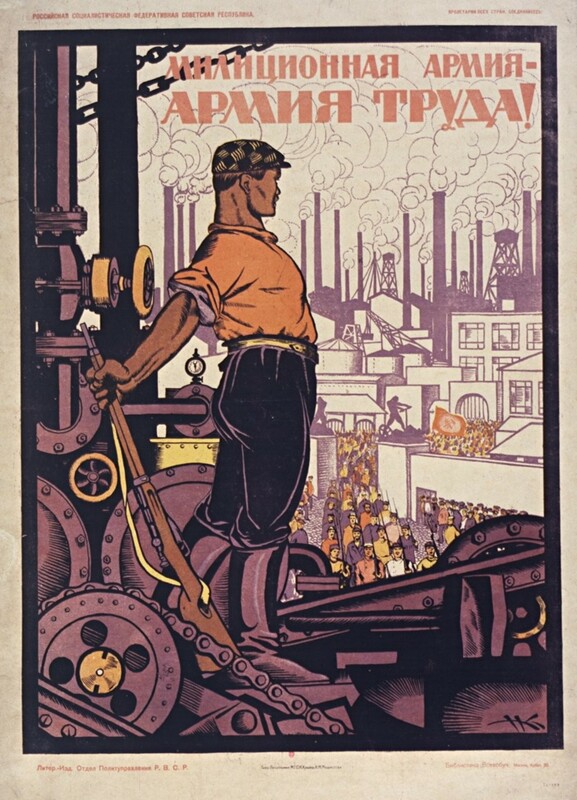 Framing the past and present in terms of the future, Askoldov portends the inescapable contradiction between Soviet patriotism and the humanity of the individual, out of which the only outcomes are either the Magazaniks’ resignation to victimhood, or Vavilova’s fatalistic capitulation to the state. This culminates in the Holocaust sequence, which repeats the technique of interweaving past and future from the execution of the deserter, but in a manner that is far more historically confrontational. In a sense, the apocalyptic imagery of The Commissar has all been leading up to Vavilova experiencing this magical realist vision. Hiding from the bombardment of the Whites and entranced by the Magazaniks’ dance, she is suddenly compelled through time and space to reckon with the bitter fate of the Ukrainian Jewry. Crucially, however, this vision neither acknowledges the future Nazis or the present White Army, depicting only, from Vavilova’s perspective, the death march of the Magazaniks into an all-consuming void. Remembering again Askoldov’s challenging of the positive absences of socialist realism, one could say that this choice nonetheless represents a poignant use of positive absence, in which that very absence of the Nazis or Whites necessarily forces the spectator to fill in the blanks, particularly with regard to the only non-Jewish participant in this vision, the Red Army commissar Vavilova. Though sympathetic to the Jews, Vavilova is nonetheless placed in the privileged position of their oppressor – or, at least, the position of someone who is indirectly complicit in representing and supporting the political forces that oppress. She follows, but stands utterly apart from them. Here, Askoldov not only commits the taboo of recognizing the Holocaust as a specifically anti-Jewish, as opposed to anti-socialist phenomenon; but also conflates through positive absence the Red Army with the reactionaries and fascists. This most significant embellishment by Askoldov of Grossman’s story ultimately comes, ironically, to take the place of Vavilova’s vision of patriotic nostalgia. 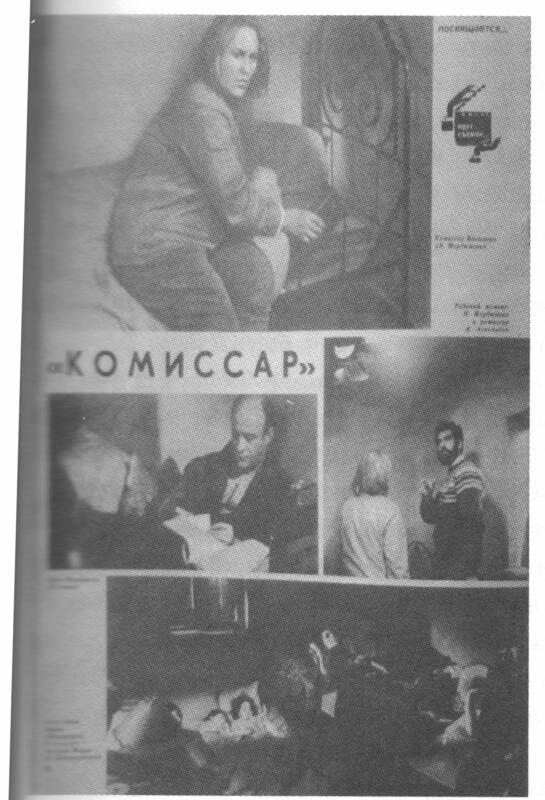 In a charitable sense, we can interpret Vavilova’s decision to abandon her child to the care of the Magazaniks as being just as informed by this vision in the film as by the one in “Berdichev”; except here Askoldov has molded the character’s motivations to be rooted in her devotion not to the Party, but to the Magazaniks, seeing her vision as an omen of what the White Army intends for the Jews in its path. But the apocalypticism of The Commissar fails to be abated. This apparently selfless act nevertheless finalizes Vavilova’s ultimate, fatalistic pursuit of death, rather than having to endure the contradictions, hypocrisies, self-censorship, and trauma of Soviet hegemony. And in yet more brilliant executions of positive absence, Askoldov repeats the subversive tenor of the Holocaust sequence by, again, referring his frame of reference persistently toward the Red Army soldiers rather than the reactionary Whites, who figure largely as a totally abstract and diabolical force that structures and validates Soviet determination. And in the apocalyptic midst of battle, Askoldov filming in black-and-white, Vavilova and her comrades do not come to embody “red” heroes of socialist realism. They are, figuratively, “whites” engulfed in a storm of white. Framing the past and present in terms of the future, The Commissar suggests that the Whites are purely mythical – they effectively do not exist. All that exists is the apocalyptic storm of the cultural majority. It was never the reactionary Whites persecuting the Jews – it was always Russians sanctifying themselves in war and attempting to purge Jewishness from the royal we. The end of this story is not one of the atonement of post-Soviet Russia. The end of this story is not even the liberation of Askoldov’s repressed vision through the liberalizing forces of capitalism. The end is the proof of positive absence, with the Soviets taking the place of the Poles and Whites as boogeymen, and where the trend of dominant ideological hegemony – with its fanatical overtures toward community, shared struggle, and universal interests – is always towards suppression. On July 27th, 1988, coming hot off the official premiere and Silver Bear win for The Commissar at the Berlin International Film Festival, the film was screened at the Library of Congress; part of a program initiated by the American-Soviet Film Exchange, in which the U.S. received The Commissar and Aleksandr Proshkin’s The Cold Summer of 1953, and the Russians received Steven Spielberg’s E.T. and Hal Ashby’s Coming Home. Larry Schiller, chairman of the American-Soviet Film Exchange, said afterward that the cuts had been made for commercial reasons, not because of censorship. He said they were made by the American distributor of the film, International Film Exchange, so that theaters could have more daily showings of it. The cuts turned out to be the second change involving the film. The first was the doctoring of publicity photos to remove Stars of David from the clothing of characters who were supposed to be oppressed Jews. Jerry Rappoport, president of the International Film Exchange, who attended the Library of Congress screening, defended the altering of the publicity stills by the American distributor and said it did not represent censorship. When the unaltered photos were distributed, he said, people mistakenly assumed that “Commissar” was a film about the Holocaust when actually it was about the Bolshevik Revolution. It’s astounding the extent to which the motivations of capitalism replicate and replace the repression of socialist realism. The drive to not merely exhibit a banned film, but to capitalize upon it as much as possible is taken as completely justifiable because it’s technically not political censorship. It never occurs to these folks that, like, if you have a film that’s been banned and nearly destroyed for twenty years, and you decide to trim it down a bit so that it’s more desirable to Americans, that that’s implicitly a kind of censorship. 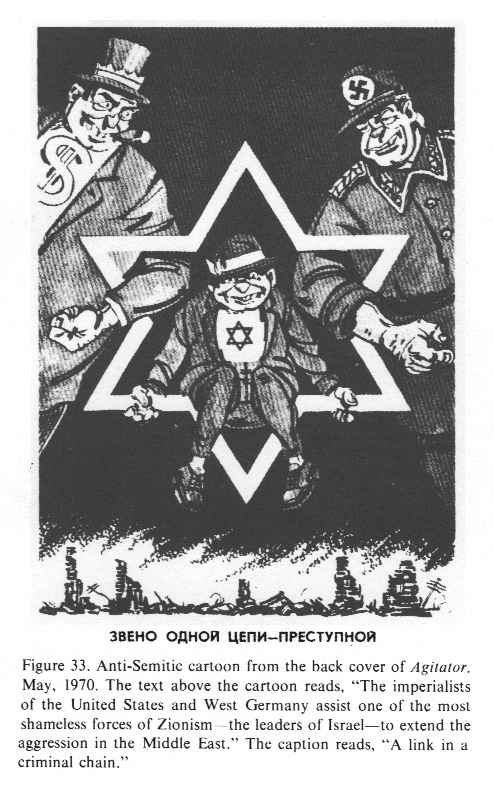 You also have to admire the consistent anti-Semitism carried over dispassionately from the Soviet censors to the cynical American capitalists. Hey, we weren’t trying to erase Jewishness, we just wanted to make sure that people knew that the film was about the Revolution, not Jews. At least the Soviets just came right out and called it “the Jewish question,” they didn’t dupe themselves into this embarrassing runaround where they try to convey to people that this movie about a woman living in a town full of Ukrainian Jews is kind of more about that than the Revolution. 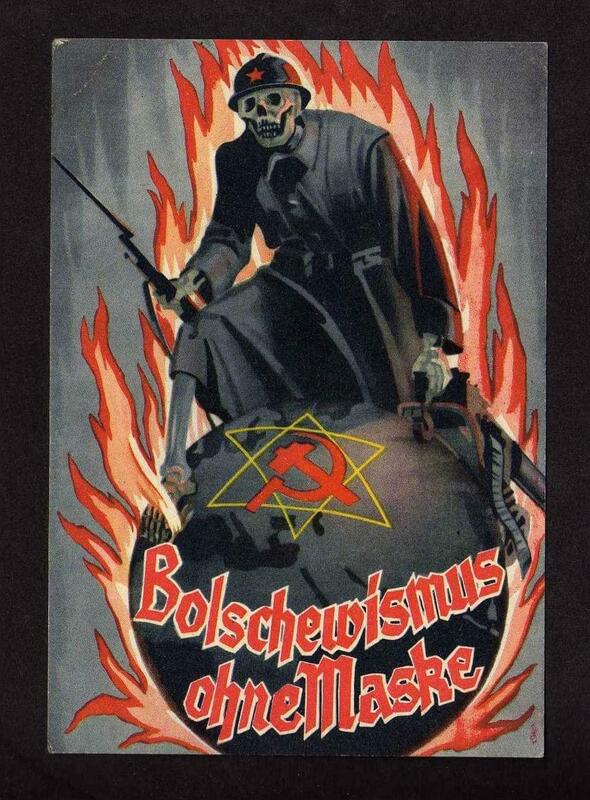 Hell, at least the Soviets were upfront about how that’s why they didn’t like the movie, there’s too much Jewishness here; these guys need to find a way to reverse manufacture The Commissar to not being about the Jewish question. Like, regardless of whether or not this is just their projection, it’s seriously fascinating to see these American distributors apparently so concerned that prospective ticket-buyers not get the wrong idea and think that this foreign arthouse movie might have something specifically to do with the history of Jews in Europe – like, they seem to intuit that lots of Americans would be put-off by it for that reason. Almost like there’s an unresolved foundation of bigotry in America and a pathological refusal to look at it too long. Hey, maybe it’s not projection. Maybe Trauberg was right. People want to see a film about a commissar. They don’t need a film about the sad fate of the Jewish people. I figured out why the hippo did it. Ashamed I left this comment so late, but yeah just gonna echo Deimos - this was wonderful. This was an incredibly fascinating read. That's to anyone who's read along or just getting to it.